So you think you can count. But can you count waves? Followers of R.N. Elliott do count waves. This week Pretzel Logic's Market Charts and Analysis (see blogroll) published a two part Introduction on understanding Elliott Wave Theory. After reading that 101 on counting waves, a handy tool for counting waves and thus analyzing the wave structure would come in handy, right? 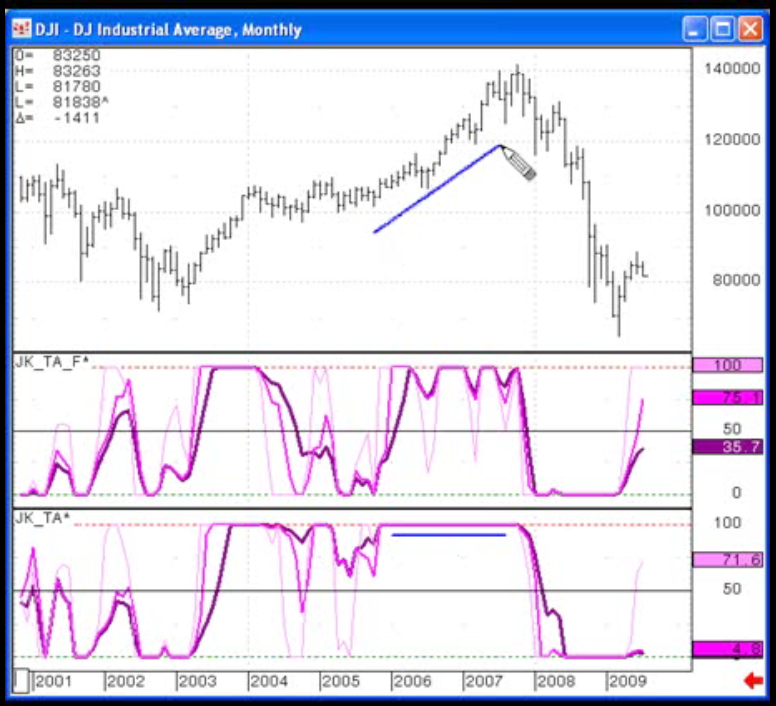 It happens some years ago Elliott Wave International's chief commodity analyst and "Futures Junctures Service" editor Jeffrey Kennedy" presented his Trend Analyzing Tool in a webinar. On Tuesday, 22 December 2009, EWI disclosed the formula to the public on their website. 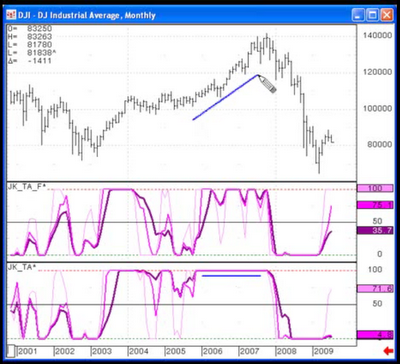 Last week and weekend some appealing trading indicators were put into the spotlights on Daneric's board (see blogroll), all of them (coincidence or not) being invented by Tom McClellan. Let's do a quick concise review and add and extra indicator. HIO is a high yield bond fund. 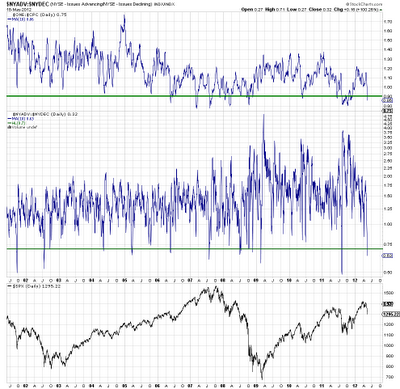 Every time its 2-day ROC% has gone below -2 (green dashed line) and turns up, it's marked a significant stock market bottom. Stocks about to hit bottom? Looking at the Call/Put ratio and NYSE breath, stocks may hit bottom in the next couple of days. Fear has taken over from complacency and has already entered extreme territory. 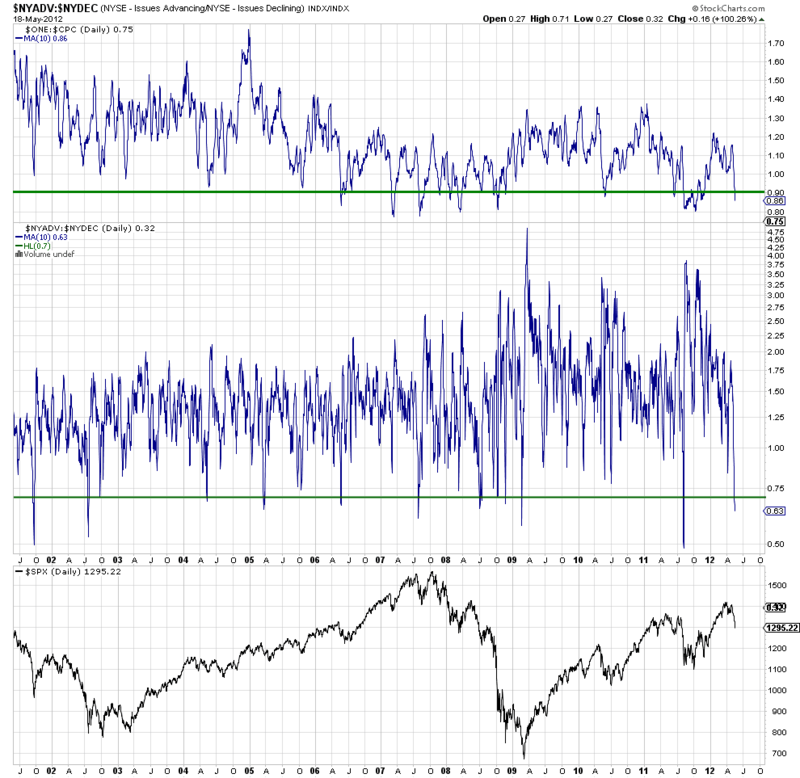 [Update:] Another piece of evidence: $NYMO is deeply oversold too. A change in momentum as shown by TrendXplorer will be the signal of a bounce or reversal. You know MACD. 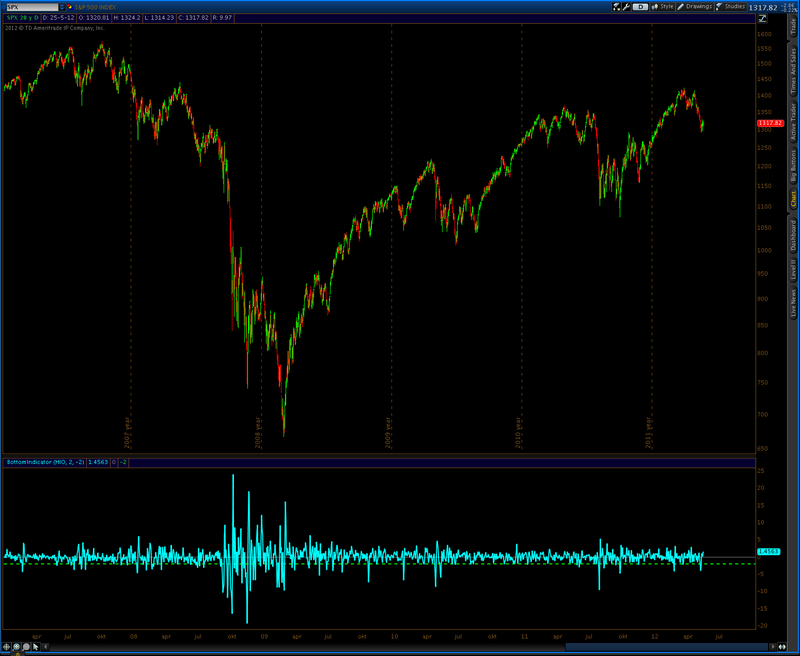 Meet its cousin: PPO or PercentagePriceOscillator. 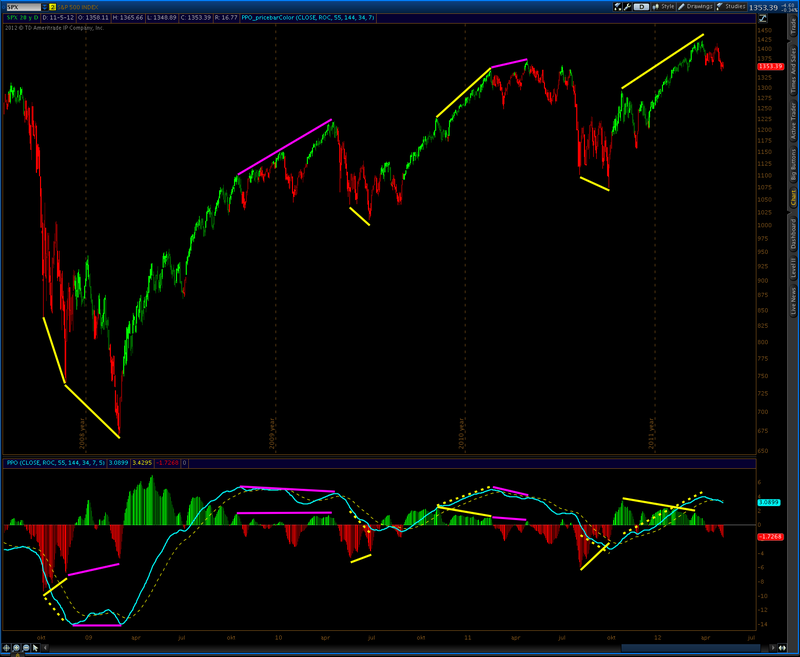 Simply put: PPO is the value of MACD divided by the longer moving average. This result is then multiplied by 100 to express the value in a percentage. Compared to MACD, PPO is more suitable for long term analysis. 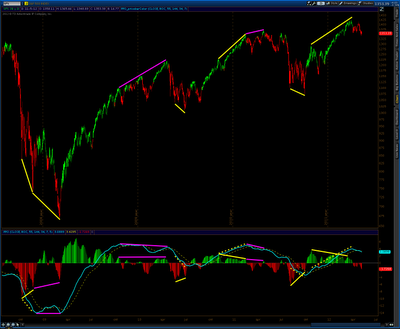 Just like MACD, PPO can have a histogram too. Trading PPO in the conventional way by the crossings of the PPO-line and the Signal line, may result in chasing trades, because PPO, just like MACD, suffers more or less lag. The amount of lag differs greatly depending on the settings used, but while fast settings reduce lag considerably, they also come with the risk of whipsawing. Why not use the histogram differently and reduce lag considerably? Why not make it dynamical to express the ROC of the PPO-line? Instead of showing the difference between the PPO-line and its Signal line, let the histogram show the daily Rate of Change of the PPO-line itself. The result is a PPO with a built-in Early Warning System combined with a nice divergence feature!